Origins of human cognitive development go back a lot longer than was once thought. Our first bipedal ancestors who came down from the trees more than 5 million years ago, had already some concept of “more” and “less” and perhaps even of rudimentary numbers upto 3 (as rhesus monkeys have today). Genetic analysis of ancient bones is showing that the origin and development of modern humans needs to be taking the Neanderthals and the Denisovans into account and perhaps has to go back at least to the time of a common ancestor from over 1 million years ago. Just considering the last 200,000 years is no longer enough. I have no doubt that the mastery of fire, the eating of cooked meat, the growth of the brain and, above all, the increased need for cooperation were interconnected and drove human cognitive development. Whether developments happened in one place and spread or happened at many places, perhaps at many times, will always be a matter of speculation. But it is not so difficult to come up with a not implausible time-line of the key developments which gave us first counting and then tallying and arithmetic and geometry and now complex number theory. The oldest evidence we have of counting are tally-sticks from over 50,000 years ago. But counting surely started long before that. I first came across and learned to use the Pareto principle in the 70s as a young engineer. It was the starting point for fault analysis of any kind. Root cause analysis always started with a “Pareto diagram”. It was an extremely powerful tool not only for fault analysis but also then in all quality improvement actions. Pareto showed in 1896 that 80% of land in Italy was owned by 20% of the population and thus was born the 80/20 rule. 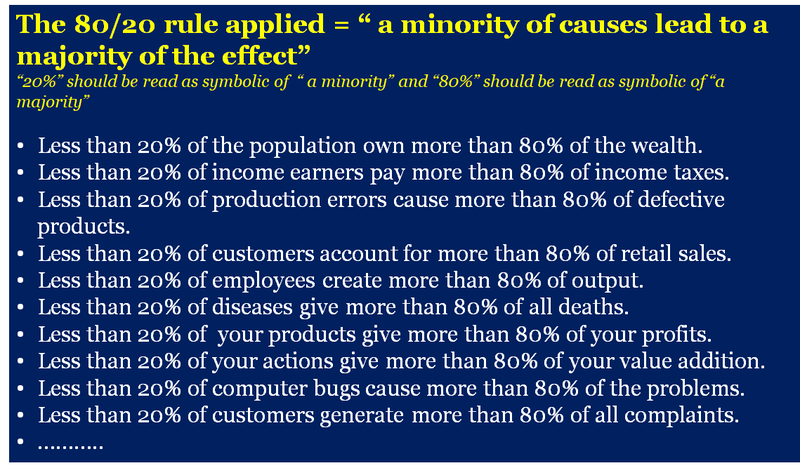 It has now become almost a cliche in all business processes and in financial and economic analysis to describe the relationship where a minority of causes lead to a majority of the result. The 80/20 rule seems to apply in almost all fields. It applies in wealth distribution, in personal and public finance, in all kinds of manufacturing, in quality control, in experimentation and in disease control. It is not perhaps so surprising. Wherever a phenomenon is subject to a power-law probability distribution, the 80/20 rule will apply, and a power-law probability distribution is perhaps the most common form of probability distribution that occurs in nature and in man-made processes. Put differently it is not at all surprising. Of all the possible causes of an observed effect, a minority of the possible causes are usually responsible for a majority of the observed effect. Perhaps we should be surprised only if the 80/20 “rule” does not apply. The “20%” and the “80%” should be taken as symbols for a “minority” and a “majority” respectively and then the 80/20 rule is ubiquitous. Of course all attempts to create a 10 hour day with 100 minutes to each hour and 100 seconds to each minute have failed. Similarly all attempts to divide the circle into 100 parts have not caught on. The use of 60 is almost as basic as the use of 10. All the non-decimal systems I learnt were embedded in memory before I was 20. I don’t expect many will remember these. As a child I learned the use of 12 and 60 from my grandmother. The use of 12 was automatic with 4 and 3. Three pice to a pie. 4 pies to an anna and 16 annas to the rupee. When driving around India with my father, miles and furlongs and yards and feet came naturally. Bushels and pecks and gallons and quarts and pints came later as an apprentice in England. Decimals are simple. But they are also simplistic. You could call this the First Law of Everything. Logic is embedded in the universe. At the Big Bang we have no idea what the prevailing laws were. Physicists merely call it a singularity where the known laws of physics did not apply. It was just another Creation Event. But thereafter – after the Big Bang – everything we observe in the universe is logical. We take logic to be inherent in the Universe around us. We discover facets of this embedded logic empirically and intuitively (and intuition is merely the synthesis of empiricism). We do not invent logic – we discover it. If logic was ever created it was created at the time of the Big Bang. Language, on the other hand, is invented by man to describe and communicate the world around us. We build into the framework of our languages, rules of logic such that the use of language is consistent with the embedded logic of the universe. But language is not always equal to the task of describing the universe around us. “I have not the words to describe ….”. And then we imbue old words with new meanings or invent new words, or new grammar. But we never make changes which are not consistent with the logic of the universe. Reasoning with language is then constrained to lie within the logical framework so constructed and therefore, also always consistent with our empirical observations of the universe around us. Given certain assumptions – as expressed by language – always lead to the same logical inferences – also as described by that language. Such inferring, or reasoning, works and – within our observable universe – is a powerful way of extrapolating from the known to the not-yet-known. The logical framework itself ensures that the inferences drawn remain consistent with the logic of the universe. In the sentence “If A is bigger than B, and if B is bigger than C, then A is bigger than C”, it is the logic framework of the language which constrains if, then and bigger to have meanings which are consistent with what we can observe. The logic framework is not the grammar of the language. Grammar would allow me to say: “If A is bigger than B, and if B is bigger than C, then A is smaller/louder/faster/heavier than C”, but the embedded logic framework of the language is what makes it ridiculous. The validity of the reasoning or of inferring requires that the logic framework of the language not be infringed. “If A is bigger than B, and if B is bigger than C, then A is smaller than C” is grammatically correct but logically invalid (incorrect). However, the statement “If A is bigger than B, and if B is bigger than C, then A is heavier than C” is grammatically correct, logically invalid but not necessarily incorrect. Mathematics (including Symbolic Logic) also contains many languages which provide a better means of describing facets of the universe which other languages cannot. But they all contain a logic framework consistent with the embedded logic of the universe. That 1 + 1 =2 is a discovery – not an invention. That 2H2 + O2 = 2H2O is also a discovery, not an invention. The rules for mathematical operations in the different branches of mathematics must always remain consistent with the embedded logic of the universe – even if the language invented has still to find actual application. Imaginary numbers and the square root of -1 were triggered by the needs of the electrical engineers. Set theory, however, was only used in physics and computing long after it was “invented”. Languages (including mathematics) are invented but each must have a logical framework which itself is consistent with the inherent logic of the universe. A new book is just out and it seems to be one I have to get. I am waiting to get hold of an electronic version. Number concepts are a human invention―a tool, much like the wheel, developed and refined over millennia. 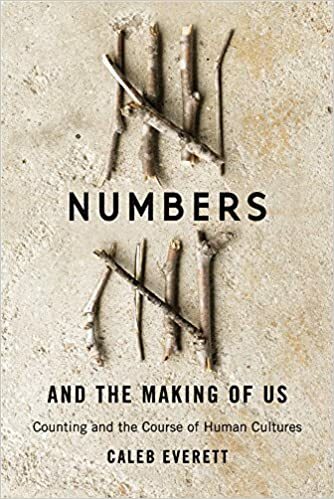 Numbers allow us to grasp quantities precisely, but they are not innate. Recent research confirms that most specific quantities are not perceived in the absence of a number system. In fact, without the use of numbers, we cannot precisely grasp quantities greater than three; our minds can only estimate beyond this surprisingly minuscule limit. Numbers fascinate me and especially how they came to be. The earliest evidence we have of humans having counting ability are ancient tally sticks made of bone and dating up to 50,000 years ago. An ability to tally at least up to 55 is evident. One of the tally sticks may have been a form of lunar calendar. By this time apparently they had a well developed concept of time. And concepts of time lead immediately and inevitably to the identification of recurring time periods. By 50,000 years ago our ancestors counted days and months and probably years. Counting numbers of people would have been child’s play. They had clearly developed some sophistication not only in “numbering” by this time but had also progressed from sounds and gestures into speech. They were well into the beginnings of language. Marks on a tally stick tell us a great deal. The practice must have been developed in response to a need. Vocalisations – words – must have existed to describe the tally marks. These marks were inherently symbolic of something else. They are evidence of the ability to symbolise and to think in abstract terms. 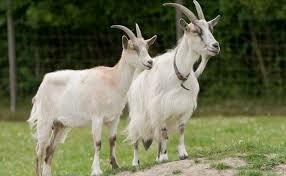 Perhaps they represented numbers of days or a count of cattle or of items of food or of number of people in the tribe. But their very existence suggests that the concept of ownership of property – by the individual or by the tribe – was already in place. Quite probably a system of trading with other tribes and protocols for such trade were also in place. At 50,000 years ago our ancestors were clearly on the threshold of using symbols not just on tally sticks or in cave paintings but in a general way and that would have been the start of developing a written language. ……. Clearly our counting is dominated by the base of 10 and our penchant for 12-based systems. 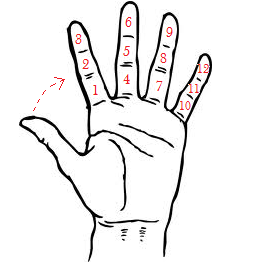 The joints on the fingers of one hand allows us to count to 12 and that together with the five fingers of the other clearly led to our many 60-based counting systems. Why then would the base 60 even come into being? 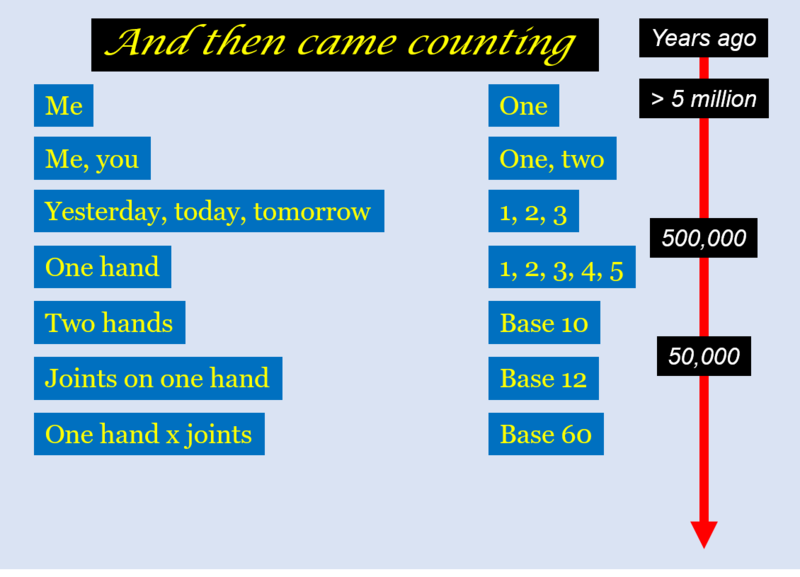 If we had 4 bones on each finger we would be using 5 x 16 = 80 rather than 60. 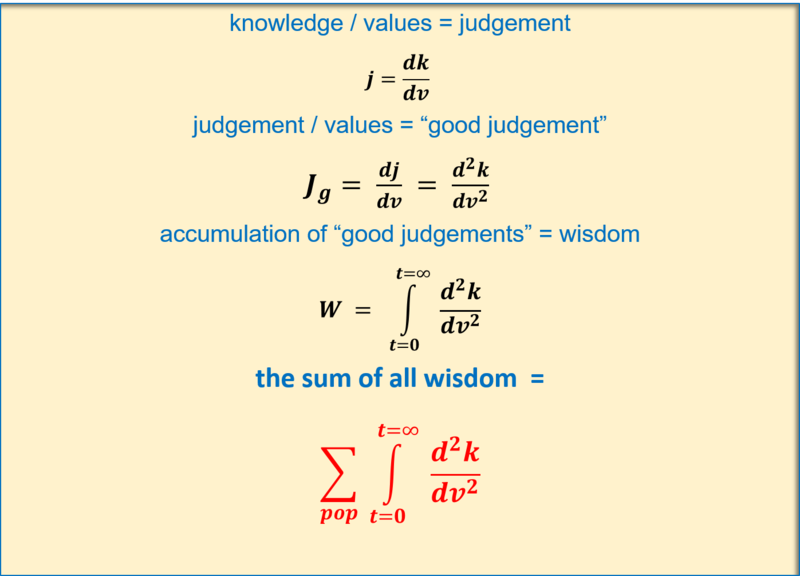 The sum of all wisdom is the summation across the population, of the integrals over time of the second values derivative of knowledge. Not the philosophy of mathematics but the mathematics of philosophy! Tests for statistical significance generating the p value are supposed to give the probability of the null hypothesis (that the observations are not a real effect and fall within the bounds of randomness). So a low p value only indicates that the null hypothesis has a low probability and therefore it is considered “statistically significant” that the observations do, in fact, describe a real effect. Quite arbitrarily it has become the custom to use 0.05 (5%) as the threshold p-value to distinguish between “statistically significant” or not. Why 5% has become the “holy number” which separates acceptance for publication and rejection, or success from failure is a little irrational. Actually what “statistically significant” means is that “the observations may or may not be a real effect but there is a low probability that they are entirely due to chance”. Even when some observations are considered just “statistically significant” there is a 1:20 chance that they are not. Moreover it is conveniently forgotten that statistical significance is called for only when we don’t know. In a coin toss there is certainty (100% probability) that the outcome will be a heads or a tail or a “lands on its edge”. Thereafter to assign a probability to one of the only 3 outcomes possible can be helpful – but it is a probability constrained within the 100% certainty of the 3 outcomes. If a million people take part in a lottery, then the 1: 1,000,000 probability of a particular individual winning has significance because there is 100% certainty that one of them will win. But when conducting clinical tests for a new drug, it is often so that there is no certainty anywhere to provide a framework and a boundary within which to apply a probability. A new article in Aeon by David Colquhoun, Professor of pharmacology at University College London and a Fellow of the Royal Society, addresses The Problem with p-values. In 2005, the epidemiologist John Ioannidis at Stanford caused a storm when he wrote the paper ‘Why Most Published Research Findings Are False’,focusing on results in certain areas of biomedicine. He’s been vindicated by subsequent investigations. For example, a recent article found that repeating 100 different results in experimental psychology confirmed the original conclusions in only 38 per cent of cases. It’s probably at least as bad for brain-imaging studies and cognitive neuroscience. How can this happen? Tests of statistical significance proceed by calculating the probability of making our observations (or the more extreme ones) if there were no real effect. This isn’t an assertion that there is no real effect, but rather a calculation of what wouldbe expected if there were no real effect. The postulate that there is no real effect is called the null hypothesis, and the probability is called the p-value. Clearly the smaller the p-value, the less plausible the null hypothesis, so the more likely it is that there is, in fact, a real effect. All you have to do is to decide how small the p-value must be before you declare that you’ve made a discovery. But that turns out to be very difficult. Confusion between these two quite different probabilities lies at the heart of why p-values are so often misinterpreted. It’s called the error of the transposed conditional. Even quite respectable sources will tell you that the p-value is the probability that your observations occurred by chance. And that is plain wrong. ……. ……. The problem of induction was solved, in principle, by the Reverend Thomas Bayes in the middle of the 18th century. He showed how to convert the probability of the observations given a hypothesis (the deductive problem) to what we actually want, the probability that the hypothesis is true given some observations (the inductive problem). But how to use his famous theorem in practice has been the subject of heated debate ever since. ……. ……. For a start, it’s high time that we abandoned the well-worn term ‘statistically significant’. The cut-off of P < 0.05 that’s almost universal in biomedical sciences is entirely arbitrary – and, as we’ve seen, it’s quite inadequate as evidence for a real effect. 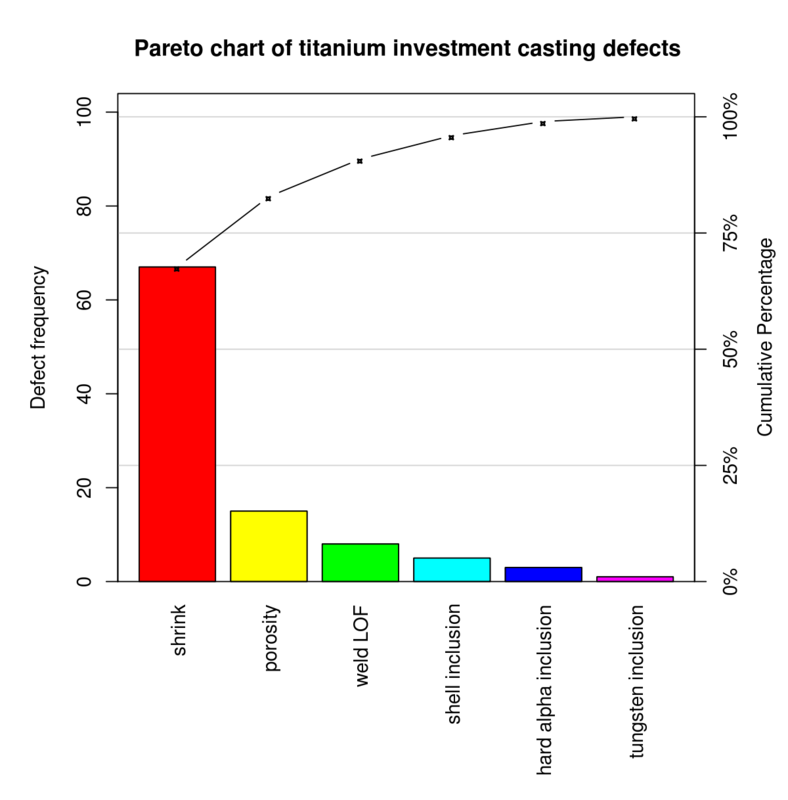 Although it’s common to blame Fisher for the magic value of 0.05, in fact Fisher said, in 1926, that P= 0.05 was a ‘low standard of significance’ and that a scientific fact should be regarded as experimentally established only if repeating the experiment ‘rarely fails to give this level of significance’.